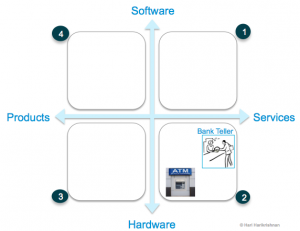 In Part III of this series on business models (See Part I, Part II here), let’s look at how technology, hardware or software, and services interact and the blurring distinctions between technology and service. Those distinctions ultimately are distinctions between humans and technology. We’ll end this with a note on the esteemed Olympian from London 2012, Oscar Pistorius. How does a business model conversation end with Pistorius? We’ll see! It started from a laid-back conversation with a friend on whether Software-as-a-Service (SaaS) is Software or Service which soon became animated. So, is SaaS really service or is it software? Or is this how-many-angels-can-dance-on-a-pinhead argument really meaningful? 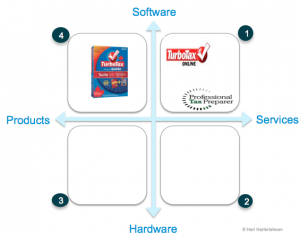 Let’s start by looking at where a software product and a SaaS offer sits in this Product-Service-Software-Hardware (PSSH) plane shown, and look at some everyday examples. 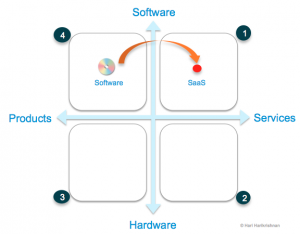 SaaS placed in quadrant 1 whereas Software sits in quadrant 4. We will use two common services – tax preparation and bank tellers – to discuss not just whether SaaS is software or service, but also how service morphs in to technology. Using tax preparation software instead of using the services of a tax preparation professional or eliminating some manual do-it-yourself (DIY) tax preparation work happened mostly in the 90s. 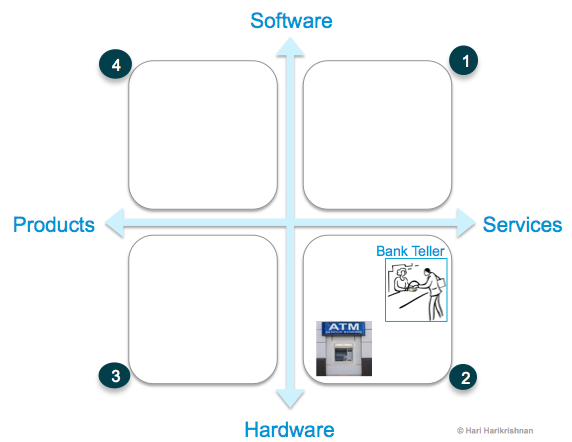 We replaced the services of humans partially with software (see the move from quadrant 1 to quadrant 4). Then Intuit made it easier by offering an online version of that software (see the move from quadrant 4 back to quadrant 1). While the online version eliminated the Buy-Install-Use-Update cycle of packaged software, it still seemed software and hence not such a big leap as replacing a professional with software. So is SaaS really software first and service afterwards? It would appear so. Teller service in banks too went through a technology change in the last few decades. We have all taken it for granted now. Teller machines (ATM) have successfully made 24×7 banking service possible. Another example of technology replacing humans to provide a service (see the placement of these services in quadrant 2, indicating the move from a service based on people & processes to a hardware-based service). So what distinguishes service from technology, if anything? If we examine the history of technology, we’ll see countless examples of the transformation of service to technology, or the transformation of one service to a better service enabled by technology. Telecommunications, where manual call setup by human operators was replaced by automatic telephone exchanges; call centers, replaced with toll-free automated phone systems connected to computers to answer repetitive customer questions etc. are other prime examples. Going beyond IT, we can see the agriculture sector having reaped the benefits of technology via use of animals first and then machines, from pre-historic times to present day. So, this process of transforming services to technology or improving services using technology is nothing new. It is simply a conversion of labour to capital for reasons as basic as productivity or efficiency and going as far as feasibility, when human labour just isn’t enough. Consequently it looks as if technology is nothing but fully automated service. Automated service comes in the form of either software or hardware and hardware is nothing but software hardened, as shown. (Somewhere a voice from an old guitar lesson whispers: “Rock is nothing but Blues played fast“). 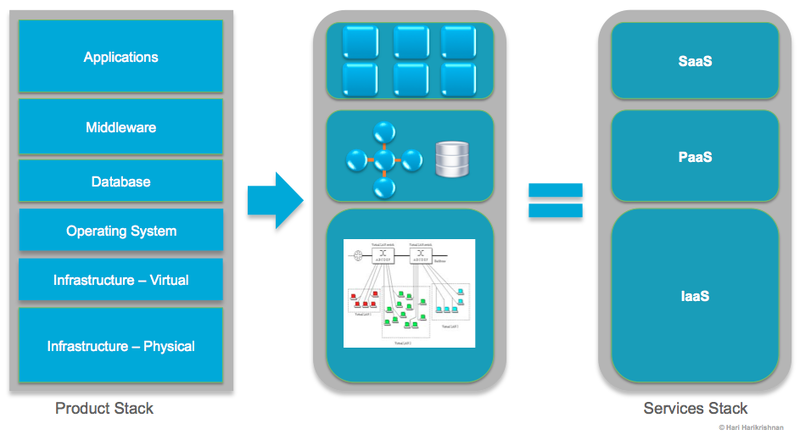 Let us recast the PSSH plane to its most basic elements as follows and see what this has to do with business models. When firms generate revenues from services, software, or hardware, they are packaging value created from a combination of people & processes (“sweat & blood”), software (“bits & bytes”) or hardware (“materials or facilities”) and selling it under different covers or skins as shown below. The labels Service, Software, Hardware etc. are references to how we package up value, specifically what is up top? Service offering is led by people or knowledge (“sweat & blood”). Software is led by “bits & bytes” and so on. 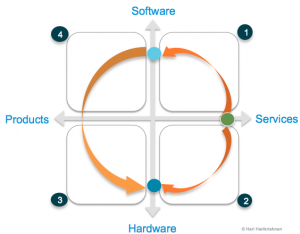 Today, most services that combines people and processes are powered by software and hardware. The AT&T technician who came to my house to troubleshoot a TV problem used his expertise aided by a diagnostic software running on an iPad, as depicted on the left stack in the picture above. (My local handyman perhaps is still unaided by software, but still dependent on his favourite DeWalt hardware!). 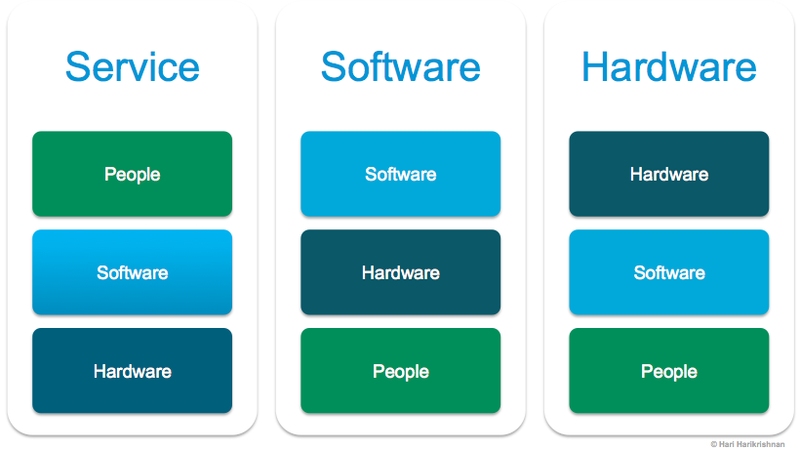 On the stacks above, you can see how a software offering is built on hardware and people, whereas a hardware offering is built on software & people, as neither software or hardware are useful in isolation. 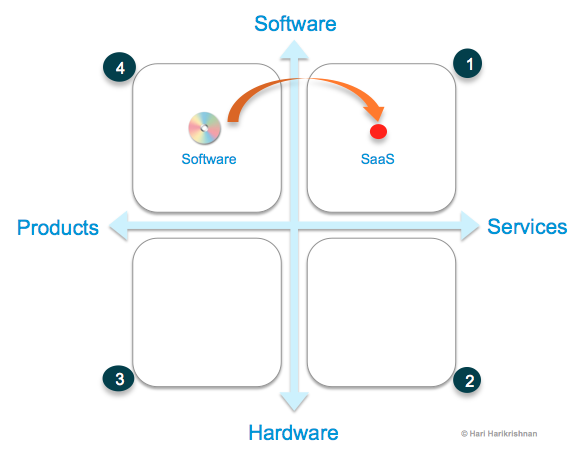 Care to distinguish between SaaS and software using the above building blocks? You’ll find the difference to be subtle. So what has all this got to do with Oscar Pistorius anyway? 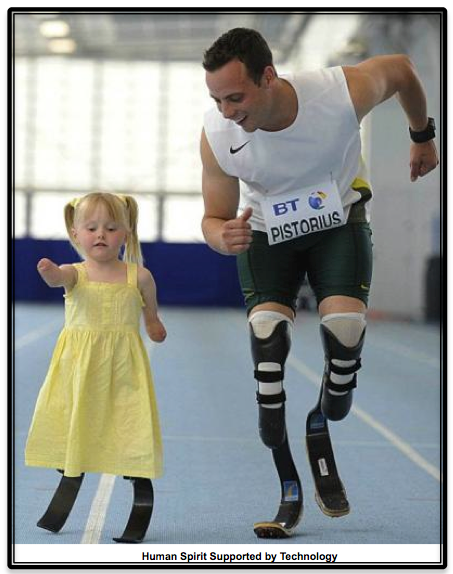 This inspiring and indelible image of Pistorius racing an adorable little girl captures in a nutshell what service (people) assisted by technology has in store for humanity — a world of diminishing impossibilities. Congratulations and thank you for opening up possibilities, Mr. Pistorius. P.S. After I posted this, my wife asked me whether I was more impressed by the technology or the man. Without a doubt, the man!